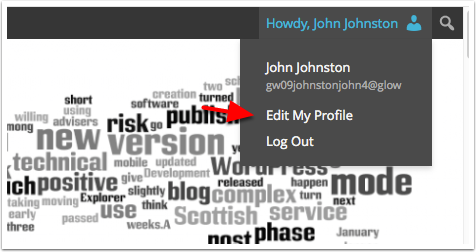 Once you log on to an instance of Glow Blogs your account is created and you have a profile. Important note: saving the user profile will only work if there is an email address set in the email field. These are usually set automatically, but you may have to set one before you can save settings. When you are logged onto Glow Blogs you will see your name(display name) at the top right of the screen on the admin bar. Hovering over this revels a menu, choose Edit My Profile. The profile is spilt into several sections the first of which is Personal Options. Visual Editor: if you disable the Visual Editor you will be presented with the Text Editor when editing posts. This require s you to use html for editing posts. Most people will use the Visual Editor. Admin Color Scheme: affects the colours you see in your Dashboard. Keyboard Shortcuts: these add extra keyboard short cuts for comment moderation, it is ulikly that many users will use this. 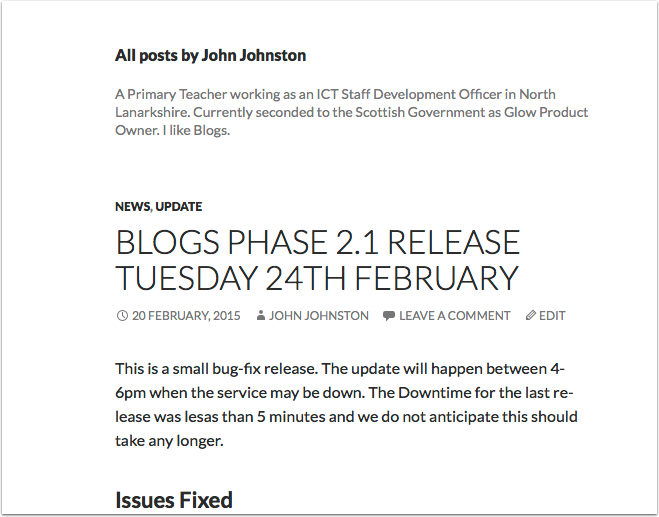 Toolbar: this sets if you see the Admin bar on all pages when logged into a Glow Blog instance. This section lets you set some personal information. It can be used to hide you identity on public blogs. First Name and Last Name are not editable they come from Unify and Seemis. Nickname will initially be filled with your glow display name, you can change it to anything you want. Display name publicly as, lets you choose what you want displayed on the blog, as Author name and when you make a comment on another glow blog. That lets you set it as First Name or anything else (coming from the Nickname) if you are worried about your name being displayed. Email, will initially be whatever comes from Unify, if you do not have O365 Mail it will be an non-working mail. 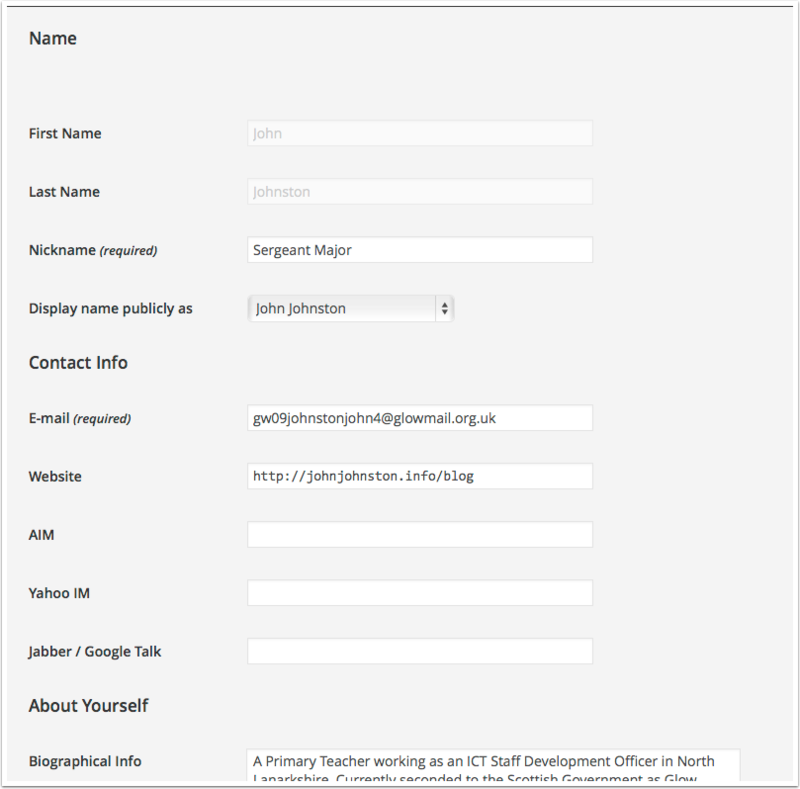 You can change this to any e-mail address you have access to, you will need to respond to an email to ‘set’ this. Website: if you fill in a full url (don’t forget http:// ) your name will link to this site in the comments. Biographical Information: some themes use this and will display it on the author’s page. You can see the author page by clicking on an Author’s name on a post. This page will show all their posts. This shows the Authors page in a twenty fourteen themed blog. My biographical information is shown at the top. 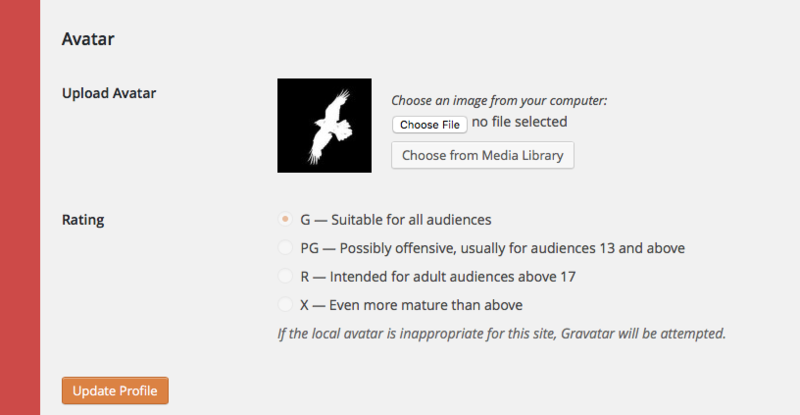 There is a setting that will allow you to upload an image to act as your avatar.